Courses for biomedical engineers responsible for maintaining medical imaging equipment operations. 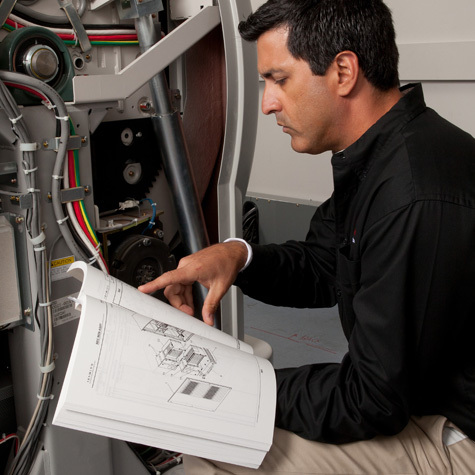 These courses include information on equipment operation, troubleshooting, and maintenance procedures. This three day clinical biomed engineer-focused course held at the Institute of Advanced Imaging in Irvine, California, provides advanced service education on Canon's Aplio 500/300 Ultrasound systems. This course includes hands-on training with lectures. At the completion of this course, you will be proficient in the following areas of operation: understand the differences between the Aplio 500/300 Ultrasound systems, operation the front panel, load software, change and restore presets, understand theory of operation of the printed circuit boards, perform diagnostics, troubleshoot the system and network with a PACS. This course includes tuition only. Airfare, meals, and lodging are not included. Basic x-ray and vascular lab training. Document to prepare student for classroom-based technical course on the Vascular Lab. This eight day clinical biomed engineer-focused course held at the Institute of Advanced Imaging in Irvine, California provides training for individuals who support any of Canon's Infinix Series Vascular X-ray systems. This course includes a blend of instructor-led class discussions and hands-on labs. At the completion of this course, you learn: configuration of angio and cardiac, theory of operation, diagnostic procedures, calibration, preventative maintenance and repair. Students must bring notebook computers equipped with Pentium-class CPUs, 10GB of hard disk space, Windows 7, DVD/CD-ROM drive, a serial port (RS232), crossover serial cable, and Ethernet wired network connectivity. Laptops are not available to borrow or rent during class. This course includes tuition only. Airfare, meals, and lodging are not included. The Vascular Troubleshooting and Repair course covers the diagnosis/isolation of faults and repair of the Infinix-I series vascular systems. Upon completion of the course, the CE will understand the overall system concepts, trace signals (Command, Drive, and Feedback), comprehend image flow and processing, and understand the image parameter settings effects on image quality. Students will become familiar with using the Service Manual to identify possible repair solutions, identify error codes, and using the service tool as a troubleshooting aid. Please note: the VL Infinix Series Biomed Service Classroom Course is a required prerequisite for this course. Students must bring notebook computers equipped with Pentium-class CPUs, 10GB of hard disk space, Windows 7, DVD/CD-ROM drive, a serial port (RS232), crossover serial cable, and Ethernet wired network connectivity. Laptops are not available to borrow or rent during class. This course includes tuition only.